As of 2010, the puzzle game Chroma provides the Enigma levels as an add-on pack. It also has nicer graphics, supports undo, can run on Windows, and has its own fresh and different set of puzzles as well. You might want to try playing that implementation instead of this one! This is the home page for Enigma, a puzzle game involving falling blocks, exploding bombs, and pushing stuff around. 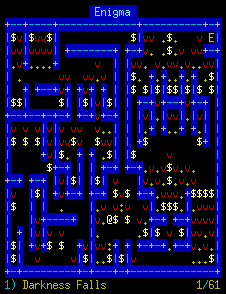 It has elements of Boulderdash and elements of Sokoban, and anybody old enough to remember XOR on the Spectrum will see large elements of that in it. I can't claim credit for inventing Enigma; the game rules were devised by somebody else, who also designed the twelve original levels. He wishes to remain anonymous, so he has donated the levels to the public domain. This reimplementation of the game engine is done in C, from scratch, by me. Enigma is intended to run on any Unix system with a working libcurses (or libncurses), which should be most of them. In particular, it's been tested on Debian GNU/Linux 2.2, Red Hat Linux 6.1, and Solaris. The source archive for Enigma is available for download here. I hope RPM and Debian packages will appear in due course. Please report bugs to anakin@pobox.com. (You might want to read this article before reporting a bug.) Patches are welcome. If anybody wants to design any extra levels, or write a man page, those would be very welcome. IMPORTANT: There is another puzzle game called Enigma, which seems to have appeared around 2002 (the game on this page dates from 2000). The other game is mouse-controlled, fully graphical, and involves a marble, whereas this one is keyboard-controlled, text-only and involves a moving @ sign. If you don't recognise the screenshot shown on this page, you might have come to the wrong page, and you might want to be looking here instead.